In an uncertain age where “alternative facts” are sadly becoming more and more mainstream, a film about the denial of the Holocaust – one of the most controversial arguments for right-wing sympathisers – suddenly feels all the more timely. 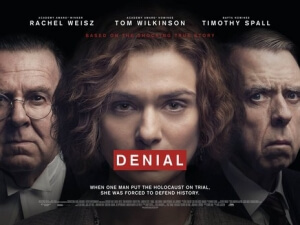 However, while Denial undeniably has the best of intentions, in this instance to dramatize the real-life court case of a Holocaust scholar versus a Holocaust denier who seeked to pervert the truth, it just doesn’t make for exceptionally compelling big-screen viewing. For those who are not familiar with the real-life legal battle, in 1996 American Holocaust scholar Deborah Lipstadt (played in the film by Rachel Weisz) was sued for libel by historian David Irving (a rather gaunt-looking Timothy Spall) after she accuses him of being a Holocaust denier in her book. The trial took place in the UK, where the burden of proof in a libel case is on the accused as opposed to in the United States where there is a presumption of innocence, so Lipstadt and her legal team, including barrister Richard Rampton (Tom Wilkinson) and solicitor Anthony Julius (Andrew Scott), were charged with finding evidence to prove that not only did the Holocaust truly happen, but that Irving distorted the facts in favour of his own argument. It’s a fascinating case, and one of the most publicised instances of Holocaust denialism in legal history, and it would perhaps serve well as perhaps a decent dramatized mini-series, not unlike American Crime Story or one of the many legal dramas you’d find on the BBC or ITV. However, it is a film designed to be shown in cinemas, and with that it ultimately suffers. The events, as depicted in the film, are not especially captivating to watch, nor do they really hold your interest, as you never get a true sense of who these people really are, and what the overall verdict – which won’t be spoiled here, if you are unfamiliar with how it actually transpired – means to them. You don’t get to know neither Lipstadt nor Irving as actual people, because the film portrays them as the most black-and-white examples of good and bad respectively without much insight into their other humanising personalities, and since Lipstadt is instructed not to testify she comes across as a mere spectator at her own trial, leaving Spall’s Irving to hog the spotlight with his thin-skinned twisting of the facts. Likewise, its’s the supporting players like Scott and Wilkinson who feel the most humanised, and you start to want to see a film more about these people, especially Scott’s solicitor figure who represented Princess Diana during her divorce. Aside from that, it’s all rather unengaging and not especially gripping viewing material; if it was viewed at home on a Sunday evening during BBC or ITV’s scheduling, sure, but not in a cinema where a film is meant to enthral and inspire you. Despite its low levels of actual entertainment, Denial is technically not a bad film. It’s well-made by director Mick Jackson, the acting is solid, and even though David Hare’s script leans way too heavily on the exposition instead of actually letting us know the real people involved, it still provides us with facts about the real-life case that are interesting, if not very exciting. It is by no means terrible, or even sub-par, but this is the kind of story that really belongs in a serial format rather than the big screen, and if it must be made into a film then at least put something in that will make the viewing experience a bit more intriguing, instead of feeling like a legal mini-series condensed into a nearly two-hour film. There’s really not that much else to say about Denial, other than to repeat the stance that, while not a poorly-made film by any means, it takes a genuinely interesting legal case that happened in real life and doesn’t really make it a particularly enthralling theatrical experience. Denial doesn’t do the real-life libel case that it is based on much justice on the big screen, because while it is a decently-made film with some solid performances, the lack of real drama and excitement as well as a heavily expositional script that ignores why we should care about the people involved make it feel like it should really belong in a small-screen format instead of a theatrical release.